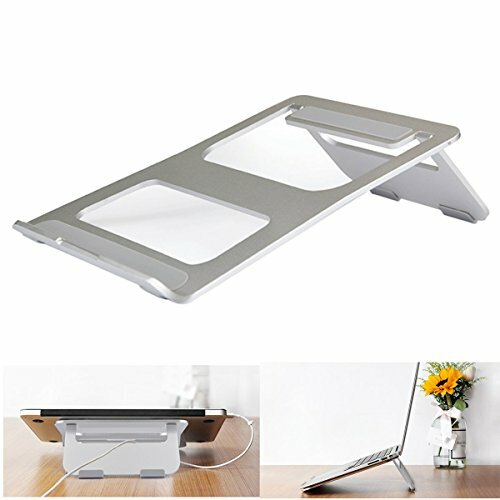 Aluminum Laptop Stand is a portable and foldable Office Notebook Holder and LAPTOP stand.Lift your laptop to a comfortable viewing height to protect your eyesigh and neck.Lift the laptop to prevent the laptop from not being ventilated due to contact with the desktop.And four-point non-skid pads keep your stand stable and protects any surface it is placed on.Simply to operated and convenient to carry wherever you go. Aluminum material contribute to an elegant 3D surface, make it simple and durable. The height of this product cannot be adjusted. COMPATIBILITY: Universal fit for almost all Laptops, Apple Macbook, Macbook Pro. Perfect fits with the laptop's screen 10"-17"
SUPER QUALITY: Made of aluminium alloy, with its elegant profile and silver-3D surface finish make it a good choice for office. Four-point non-skid pads keep your stand stable and protects any surface it is placed on. LIGHTWEIGHT AND FOLDABLE: Weighs just 1.15pounds, quickly folds into a 0.16 inches thickness and carries easily. You can put it in backpack or laptop bag.AND FOLDABLE: Weighs just 1.15pounds, quickly folds into a 0.16 inches thickness and carries easily. You can put it in backpack or laptop bag. KEEP YOUR HEAD UP: Raise your laptop to the perfect degrees of 2.60 inches very suitable for usage to protect your neck, eyesign, spine. If you have any questions about this product by CCdo, contact us by completing and submitting the form below. If you are looking for a specif part number, please include it with your message.